If you’re looking to get your commercial or industrial floors resurfaced, you’re likely scouring the web for concrete flooring contractors and trying to decide who best suits your needs (hopefully, that’s how you stumbled upon this page, and hopefully, you continue to read on and explore what AWSP has to offer!). If this sounds like you, we’ve got just the thing to help you on your search. In this blog, we are going to discuss what we think all concrete flooring contractors should guarantee when taking on a job. 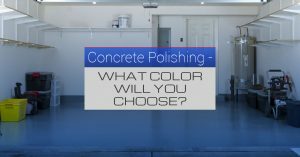 Concrete Polishing—What Color Will You Choose? Deciding to get your old concrete floors resurfaced is a big decision. First, you have to find reputable, experienced concrete flooring contractors (if you’re in the Denver area this is actually quite simple—go with All West Surface Prep!). And after doing this, you’ll then have to decide on a color and design. That is, of course, if you choose to get your new floor polished or coated in a durable epoxy, which as we’ve mentioned can be a very wise long-term decision (check out the benefits of epoxy coating here).